Facebook’s not just for keeping tabs on friends and filling out quizzes — it can also be used as a highly effective business tool. It’s great for marketing your products, and connecting with your customers. Here are 32 ways to use Facebook in your business. Fill out your profile completely to earn trust. Establish a business account if you don’t already have one. Stay out of trouble by reading the Facebook rules regarding business accounts. Keep any personal parts of your profile private through Settings. Create friends lists such as “Work,” “Family” and “Limited Profile” for finer-grained control over your profile privacy. Post a professional or business casual photos of yourself to reinforce your brand. Limit business contacts’ access to personal photos. Post your newsletter subscription information and archives somewhere in your profile. Obtain a Facebook vanity URL so that people can find you easily. Add your Facebok URL to your email signature and any marketing collateral (business cards, etc.) so prospects can learn more about you. Share useful articles and links to presentation and valuable resources that interest customers and prospects on your wall, to establish credibility. Combine Facebook with other social media tools like Twitter. Before traveling, check contacts locations so you can meet with those in the city where you’re heading. Research prospects before meeting or contacting them. Upload your contacts from your email client to find more connections. Use Find Friends for suggestions of other people you may know to expand your network even further. Look for mutual contacts on your contacts’ friends lists. Find experts in your field and invite them as a guest blogger on your blog or speaker at your event. Market your products by posting discounts and package deals. Share survey or research data to gain credibility. Use Facebook Connect to add social networking features to your web site. Suggest Friends to clients and colleagues — by helping them, you establish trust. Buy Facebook ads to target your exact audience. Read up on Facebook Beacon to see if it might be useful for you. Start a group or fan page for product, brand or business. Unless you or your business is already a household name, a group is usually the better choice. Add basic information to the group or fan page such as links to company site, newsletter subscription information and newsletter archives. Post upcoming events including webinars, conferences and other programs where you or someone from your company will be present. Update your group or fan page on a regular basis with helpful information and answers to questions. Join network, industry and alumni groups related to your business. Use search to find groups and fan pages related to your business by industry, location and career. 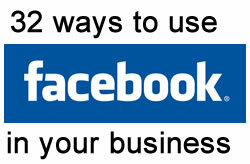 How do you use Facebook for business?